Bobby the bumble bee is larger than life, but don’t worry, he won’t sting! Measuring approximately 11.5 inches long when using worsted weight yarn, he is big and cuddly. This bumble bee amigurumi pattern includes step-by-step photos and you can contact me along the way to ask any questions. It is an intermediate level pattern, but only because there are a few colour changes. 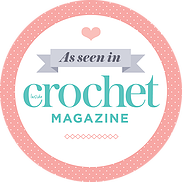 The pattern involves starting with a magic ring, single crochet, double crochet, slip stitches, increasing, decreasing, colour changes and attaching pieces.